This delicious cocktail was designed by Le Cordon Bleu New Zealand’s Bachelor of Culinary Arts Student & Master Mixologist, Akash Singh Chauhan. "Cloudy Aviation" is his take on the classic aviation cocktail. It was created in celebration of Le Cordon Bleu’s 120th Anniversary – with each layer symbolizing the essence of studying at Le Cordon Bleu as interpreted by Akash. The red layer symbolizes his passion & love for the Culinary Arts, the blue represents the wisdom and knowledge gained whilst studying at Le Cordon Bleu and the white foreshadows the bright future that awaits him after graduating. 1. 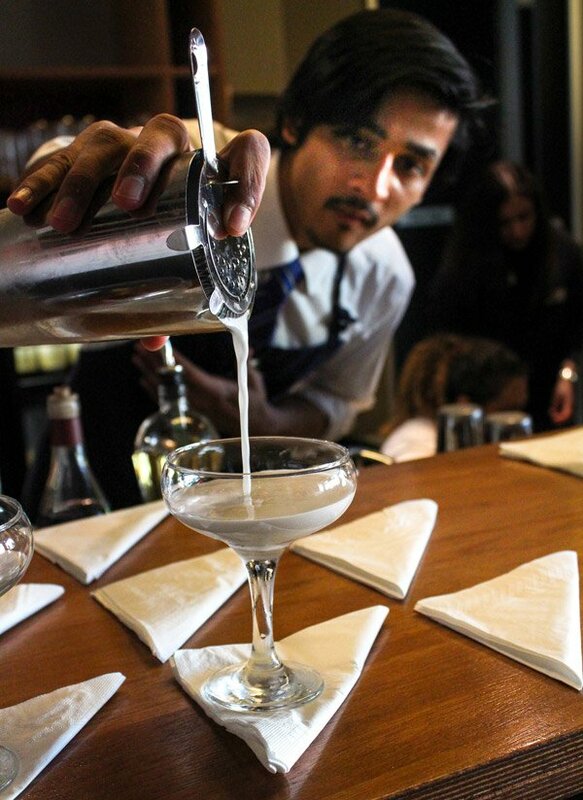 The first step to get this cocktail right is to have a good froth for which we will use a technique called the dry shake. First used by Chad Solomon of the Pegu Club NY, for this technique you can use a gym shaker spring or simply use the wire spiral of the hawthorn strainer. 2. We start off with the 50mls of gin, 15mls of St Germain, 15mls of Violet Liquor, 15mls of lemon juice and 1 egg white into a shaker, add the shaker's spring into the shaker, remember no ice. Shake it hard but carefully, because unlike the cold shake, a dry shake creates a bit of pressure and can explode. 3.Then remove the spring and add the ice and shake again. Not too hard, enough to chill the cocktail. 4.Pop a cherry in a chilled coupe glass, and pour the cool and frothy cocktail into the glass. And garnish with a few drops of bitters, you can also draw a design using a cocktail straw. 5.Drink the foamy cocktail that makes you feel like you are flying with the clouds.